Blurb: An edgy book for teens that spans the gap between YA and adult fiction. Life after high school is tough enough without having to go 15 rounds with your inner demon. 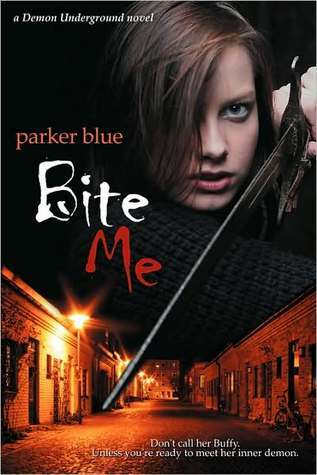 Val Shapiro is just your ordinary, part-demon, teenaged vampire hunter with a Texas drawl. And a pet hell-hound named Fang. Soon enough she finds herself deep in the underbelly of the city, discovering the secrets of the Demon Underground and fighting to save those she loves. Whether they love her back or not. I really enjoyed reading this book. The beginning seemed a little shaky, but I think that can be normal for the first book in a series. It took a couple chapters into the book before it really got & held my attention, but after that it really did. I think the concept of Val being a part-demon, and in her case a succubus, was intriguing and pretty unique. She is strong and confident which makes for a great heroine, but she also fears her half demon part of her nature. Her relationship with Fang was really cool and there were a couple of side characters that were really interesting. A few of the side characters however where somewhat forgettable and I hope that the author develops them a little more in the second book. I did like this book and definitely want to read the other books in the series, because I think that they will get better as they go. While this book wasn't perfect, it was still a good read with a unique and interesting story.